Taking a trip this summer? Whether you’re vacationing overseas, visiting family across the country, or going away for business; it’s important that you pack as lightly and efficiently as possible. Everyone has different techniques but there are some tricks that are universal. In the end it depends on what you are packing and what your packing goal is. Do you want to fit as much as possible in a carry-on? Do you have dresses and blazers that you don’t want to wrinkle? Do you want to save enough space and weight to bring back gifts on the way home? There are all kinds of tips for each case, so make sure you know your specific purpose in efficient packing! Here are some great tips and techniques from Song Real Estate that you can use no matter where you’re going or what you need to pack. Folding your clothes and laying them flat in your suitcase is probably the first thing you go to do when packing for a trip. You might not realize it, but that method takes up tons of your suitcase’s valuable real estate. The rolling clothes method will multiply the amount of clothing you can fit in your bag and, if you master it, reduce wrinkles significantly. This trick works best for people who are packing more casual outfits as opposed to suits and professional clothing. When you roll your clothes, make sure you do it as tight as possible. For shirts, start at the collar and roll downward. 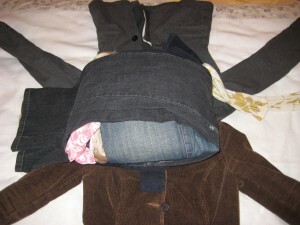 Fold the sleeves over the front of the shirt and stack them along the edge of your suitcases. For pants fold them in half lengthwise and roll them up starting at the waist. This method works best if you do it on a table or another hard surface. This method saves a ridiculous amount of space, but if you don’t do it just right it can leave your clothes just as wrinkled. This method can almost eliminate wrinkles when done right, but doesn’t save as much space as the rolling method. The end goal of this method is to create one big brick of clothing with each piece ‘wrapped’ around the others. You will need an object to act as the center of the bundle: I usually use a purse or small bag. You can fill the pouch with soft items like socks, a swimsuit, and underwear. This should make a sort of small, firm “pillow” for you to wrap the clothes around. When you wrap up your bundle, you will want your clothes to go in a particular order. Larger and more wrinkle-prone items should end up on the outside and less easily wrinkled garments will lay closer to the core. Lay them in alternating directions and so that the core object can be placed in the middle of each garment. Button the fronts of shirts, cardigans, and jackets; zip up your pants, skirts, and dresses, and make sure every item lies smoothly in the pile facing up. Now, you need to wrap the bundle up according to the diagram below. Be sure to wrap it as tightly as possible to save room. 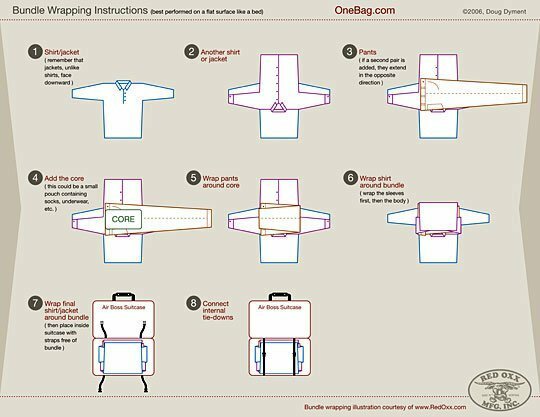 Packing your bag efficiently is hard to master but it just takes practice! Packing for a trip can be challenging, but maybe It’s time for you to consider packing to move! If it’s time for you and your family to find a new home, call Song Real Estate today!